As any parent will tell you, bullying is a big problem for today’s kids. Christianity Cove & the Children’s Ministry Academy have decided to partner to hold a series of “Virtual Roundtables” on the subject of Bullying & the Bible. Our goal is simple: We want to equip children to confront the modern challenges of Bullying by turning to the Bible for wisdom, strength, and hope. Throughout history, two things have not changed: (a) God’s word, and (b) human nature. 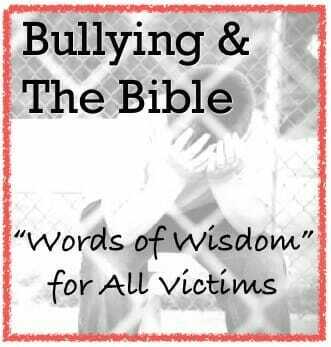 God’s word speaks loudly and clearly on the subject of bullying, and the stories are relevant to cyber bullying, school yard bullying, and neighborhood bullying. Each of the 6 experts prepared their answer independently, and we have simply compiled their wonderful & diverse ideas below. We hope you enjoy the discussion:-) We’d love to invite you to join the conversation, if you’d like to contribute a reply, thought, or idea,- don’t hesitate to leave us a note in the “Comments” below this post. Pastor at Covenant Fellowship in Glen Mills, PA & author of Gospel Story for Kids. While we don’t have any record of Jesus being bullied or mistreated as a boy, Jesus did speak to how we are to relate to those who are unkind and mean to us which applies to bullying. When someone mistreats us, the natural instinct is to feel anger, even hatred toward that person. But Jesus here points us to a much different response. You see, while we were enemies of God, He loved us by sending his only Son Jesus to die on the cross for our sins so that we could be forgiven. It is this same kind of undeserving love that Jesus tells us to extend to our enemies. Every time a child is bullied, they need help in processing how to deal with the hurt, fear, and anger which result. When we take them to the gospel, we give them the opportunity to process what happened redemptively. What better way forward than to help our children understand that the world is filled with lost souls who need our prayers. What better hope for moving on from a bullying incident than pointing them to the cross and the sacrifice of Jesus for our sins and then inviting them to extend the same forgiveness to those who oppress us. I lead a Kid’s intercessory prayer group (ages 5 yrs. to 6th grade) on Tuesday evenings at our church. I equip the kids in all the areas of prayer, (praying the bible, pray for healing, praying for the nations, etc…) as part of the time I always include a time that I call listening praying (soaking prayer), their time for God to speak to their heart personally. After we’ve had the quiet time I always ask if God spoke to them, if there’s something that’s bothering them, they want us to prayer and minister to them about. I have been amazed especially the last 5 to 6 years the kids that will want prayer for some one at school, on the bus, playing in their neighbor, who has either been cruel to them, picked on them, and in some form bullied them. Most of the time they have told no-one not even their Moms. The prayer environment creates an atmosphere where the child feels safe to share to share what happened. I listen, then will usually ask them how that made them feel, it’s important to validation their feelings, not dismiss it with remarks like “well kids will be kids”. I might respond with “I’m so sorry that happened to you, I can see why that bothered you. We (the kids and myself) will pray for them,(it also opens up discussion that others will share similar situations). If fear is involved, I share the scripture that “Gods not given them a spirit of fear, but love, power and a sound mind,” then mentor them to use the scripture when they feel those feelings of fear, to say the verse till they feel better. I encourage them to tell their Moms, the person in charge, or an adult they trust. I will usually share with a parent what happened, and suggest for them to create a time to talk to the child about what’s going on in their life without the child feeling I betrayed their confidence. In the day we live we are all so busy that many times we get so distracted by life we miss things that might be going on in our children. Make time to develop a prayer life with your children and let them learn to express their hearts..
A child who endures the pain of bullying is a hero. It takes courage to face each day knowing you will be taunted, teased, and picked on. If a child comes to you with the problem of bulling, there are several things you can do to help. Commend the child for coming forward. Praise them for their strength to take a stand. Speak words of life into these children. They have been bruised and are likely to have low self esteem. Be sure they understand they are safe sharing with you. Many children who are being bullied do not have a safe person to talk. They may think they cannot talk about it without repercussions. Children need to be taught how to be courageous and stand up for themselves. Teaching a child to have a healthy self image of themselves creates a confident kid. They do not deserve to be treated anything less than the treasure they are. In second Kings Chapter nine we read the story of Jehu and Jezebel. Jezebel was a manipulating and conniving bully who used her power to push people around. It took the courage of Jehu to stand against Jezebel and have her destroyed. Courage was Jehu’s strength. First Samuel seventeen tells the story of David and Goliath. A young man with no training stood up to a powerful warrior who was a tormentor. David did not allow man’s preserved weakness of him to stop him from boldly confronting and eliminating the bully Goliath. David’s strength was in boldness. A child who has suffered from bullying may have developed ungodly beliefs about himself. It is important to teach children how to counteract what was said and done to them. Encourage them to share or write out what was spoken and done to them. 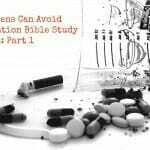 Then, go through the Scriptures and find out what God says about this. If they are told they are ugly, God’s word states in Psalms 47:11a “The King is enthralled by your beauty”. If they have been told they are better off dead, how is that possible? Each person’s life has value. We were created with a purpose (Jeremiah 1:5). When we fulfill that purpose we walk into our destiny and touch the lives of those around us. As a child realizes their value and importance, they can stand up to whatever may come their way. The governor’s soldiers took Jesus into the palace, which was called the Praetorium. All the rest of the soldiers gathered around him. They took off his clothes and put a purple robe on him. Then they twisted thorns together to make a crown. They placed it on his head. They put a stick in his right hand. Then they fell on their knees in front of him and made fun of him. “We honor you, king of the Jews!” they said. They spit on him. They hit him on the head with the stick again and again. Jesus knows first hand what it is to be bullied. After Jesus had been arrested, the solider hurt him by beating Him and making fun of Him. It can be hard to talk about the abuse you take from a bully because you may feel like no one can understand what you’re going through. You can always speak to Jesus, however, even if you feel like you can’t talk to anyone else because He knows exactly what it is like to both be hurt physically and emotionally. What you should keep in mind, however, is that later on in this same Bible story, Jesus forgives those who have hurt Him, saying to His Father in heaven, “Father, forgive them. They don’t know what they are doing.” (Luke 23:32, NIrV). There is power in forgiveness. As hard as it might be, you should follow Jesus’ example and forgive the bullies who hurt you as well. Initially, when talking about the issue of bullying, my thoughts went to the stories of David and King Saul. King Saul had some pretty significant insecurity issues and felt amazingly intimidated by David. For no reason, (except for being jealous), King Saul sought out to bring harm to David. Sometimes people who are dealing with insecurity or other issues are going to treat us improperly, just like King Saul did with David. David had a very high level of respect for Saul. He knew that Saul was loved by God and had been anointed by God, so he didn’t seek to harm Kind Saul. We should take a lesson here. Even when a bully treats us with disrespect, it is important to remember that God made that bully and cares for him or her as well. We can take whatever action our parents or teachers suggest, but it’s important to remember that God love him/her and we should treat him/her the way that God does them. Being bullied is a hard thing to deal with. It’s hard to talk about, hard to understand, and hard to move past. I don’t know a soul who truly knows a fool proof method on bullying, but there is one truth I do know. God created each and every being on this earth and saw that they were good. You are good. You are not insignificant, or any of the other hateful things that are being said, or done. You are good. Psalm 139 says you were knit in your mother’s womb. God took great care in making you just the way you are, and saw that everything about you was good. When things seem dark, and lonely, remember that you are good. You are a beautiful creation. You have a special place here in the web of life. You are good. We’d like to sincerely thank everyone below for continuing to share their knowledge and for giving their time to this Roundtable Discussion. Please feel free to comment, tweet, Pin and “Like” this post to help spread the word. THANK YOU SO MUCH!!! BECAUSE OF THIS I GOT AN IDEAS FOR HELPING MY FRIEND 🙂 AND BLESSED CO’Z I LEARNED A LOT TOO WHILE READING IT!!! I remember when I was in middle school I experienced being bullied by my some of my classmate friends verbally and sometimes physically. I never took up for myself and I felt bad. But, my younger sister would always take up for me. Then they would leave me alone. Then when I was in high school in the 9th grade, I was sitting in the cafeteria eating lunch with one of my friends who was in the 11th grade and he was real nice to me. Then this guy who was in the 12th grade, he was sitting far across from the other tables and had a soda bottle and threw it across the cafeteria and hit me in the side of my head and the soda got all over my jacket. It hurt so bad and so humiliated. Then, my friend who was in the 11th grader got some paper towels and napkins to wipe my jacket off for me. After, I told the principle about it and he never did anything about it. But, I still forgave. Jesus helped me make it through middle school and high school though. I always memorize Psalm 139 vs 13-16 and Jeremiah 29 vs 11 now. This article is amazing! I am tring to make a VBS that is about bulling,it is a very important subject where I live. I have been bullied since I was in middle school. I am now 17 years old and still being harassed and bullied. Tonight I was laying in bed and started to think about what tomorrow has in hold for me. As I started to cry cause I realized just like all the other days it would end in sadness I realized instead of feeling sorry for my self and feeling lonely I should turn to God. I started to look up bible verses and soon came across this, along with some other bible verses that helped me. Within a matter of minutes I stopped crying because I felt sad and started crying because i knew how much God loves me. This article is great on the subject of bulling and putting God into perspective and showing how he can relate to problems one may have and how he can help with each and everyone of them. although this probably has many gramatical errors cause I’m extremely tired I hope I got the point across of how much this article helped me and how much God values and loves all of us. I’ve been bullied all my life in school and even at a couple jobs. Just recently I had to leave a job I really enjoyed doing because of a person (co-worker) who bullied and abused me on the job. She had the gall to blame me for her actions every time she messed up, she blamed me for being the problem when I’m really the victim. This is the very kind of abuse and bullied I endured as a student in grade school and high school all because I was different from everybody else and have mild learning disabilities. I stuck out like a huge sore thumb to say the least! Anyway–I’d gone to a Catholic grade school but never really understood why Jesus wants us to forgive, turn the other cheek, etc. For the longest time, I’ve done the exact opposite. I still struggle against anger, resentment, and hurt feelings towards the co-worker and even the rest of the people at that workplace (because nobody really did anything to stop it). Am I wrong to feel this way? Is it a normal part of healing? I don’t even know! I hate feeling the anger, resentment, and all the other bad/negative stuff that comes along with it. I wish I could switch it off like a light switch but it’s not that easy. I have been bullied dating back to my childhood. Now at the age of fifty-six I laugh at the wind and pray for my bullies, because they led me to my one true love, Jesus Christ. He explained everything to me. Bullies are representatives of the spiritual forces of evil in or surrounding the bullies’ lives, and, because of this darkness, they target the spiritual light hidden in others. You have a divine purpose, claim it. Do not spend another day allowing the forces of hell from keeping you from that destiny, find some or more Christians. They have been there and will carry you though it and mentor you with words of wisdom. Remember what was meant for evil will prove to be your greatest blessing. I would have never thought of it that way if i had not read this, Thank you so much . I am going to tell my daughter about this she is having a hard time at school \ she said mom no matter how nice i am to those people they are still mean to me 🙁 breaks my heart. You know i think God lead me to this site wanted me to see this. Thank you again keep spreading those words. Sometimes he wants us to go through the abuse and not quit.if someone blames u and ur doing the right thing or christ…it is most likely persecution….if they r verbally abusive….sometimes God wants to do something in u as the attacks come.this is old but when I read that it made me think of all I’ve been through and how even when I wanted to quit because of verbal abuse…..Holy Spirit clearly said do not…and he began to change my reaction and though td about myself….I didn’t believe what was said like I once did….so rejection and abuse wasn’t attracted of me as much.I too am very different and have a few learning disabilities,yet am very smart as well,and God is helping me with the “slow” areas that I get abused on.even today…..strangely enough I came on here for my 6 year old daughter who is being bullied by a boy in her class….I was praying for my own mind this morning to be healed from trauma through the years.I believe this will help someone. I asked to repair and heal my mind…thought processes..heal the areas where I struggle in that cause alot of conflict just because I’m being me.idk if that makes sense.there’s healing needed is what I’m saying….not something I’m doing on purpose. Just don’t quit in the midst of persecution…sometimes it comes in the form of abuse bullying etc….it’s sooooo hard and wearisome sometimes I know but God says u can make it through u can. 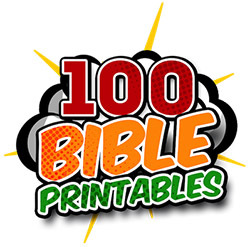 I’m realizing I need to teach my daughter tools..biblically sound tools not just woosah think positive thoughts tools that won’t really work…but I am so grateful to have came across this site Jesus bless all who read and I hope what I was saying saying ounces clear. IF God desires u to go through trails in this area…He will make a way out…..(I’m mostly speaking to adults ..children…it’s a little different…even so if God doesn’t remove the bully or situation…He is giving grace for the child to be stronger and make it through ). It ‘s a tough subject especially when kids are involved but God will take care of us and teach how to overcome in the face of adversity. I too agree that this article is definitely helpful when dealing with this issue. We must also remember that God is love and therefore commanded us to love on another… Keeping that in mind, if we teach our children to treat each other the way we want to be treated in that manner of respect, then we have accomplished planting a seed that will continue to grow with them. The flip side of that is to also teach them that there are consequences that go along with bullying meaning “what you do to someone else will come back to you”. We have choices in life, and whatever choices we make will determine a postive or negative outcome. Thank you all for wrestling through this issue and seeking how to help the kids in your care when they encounter bullies. Let me challenge you all and your readers to pursue this issue with the utmost care and whichever approach you choose also intentionally incorporate Bernadette’s suggestions. 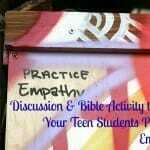 When the disciples were on the boat with Jesus they came and as they woke him asked “Teacher, do you not care that we are perishing?” As a kid as I suffered bullying rooted in racism my cries to both my parents and children’s leaders was that same cry only in a kid’s language. While my parents and church leaders were God fearing and Gospel loving people, they unfortunately answered that cry with the same approach that all of you, except Bernadette have taken. Honestly it was hollow and came very close to creating a hatred in me for the Lord. Finally in Junior High a new youth pastor took me out to the arcade, handed me two rolls of quarters and about one roll in said, “so Matt tell me about life.” After my response he said, “I wish I could drive by that guy’s house and toss a Molotov cocktail through the window.” No, he really didn’t advocate violence as a means to an end, but he was the first person who looked at the storm in my life rebuked the wind. Much like what Jesus did in that boat, he later dialogued with me and cared about the condition of my heart and my understanding of the Gospel and how all of that interplayed with the issue of bullying for me. The disciples were with Jesus in the flesh, they had seen all that he had done, they listened to him day in and day out, they had responded to his call and yet, they were so overcome with fear on that boat that they couldn’t even remember who was in the boat with them. He dealt with their fear first and then used it as a teaching opportunity. Looking back now with the blessing of adult 20-20 vision, I know that I was, as Bernadette said, developing ungodly views about myself and ultimately about God. When that youth pastor listened to my cry, rebuked the wind, helped me find a way to stop the waves, and then used it as a teaching opportunity, I can honestly say he was the lynchpin in my faith journey that kept me from walking away from God. I was thinking about the bully in relation to these suggestions. I have a friend who found out her child had been the bully! She was devastated. I think this advise could be used to talk with your child if your child has been accused of bullying… sit down and show him what the bible says, confirm that you yourself believe this about him and all children and get into a conversation about forgiveness etc. During the conversation you might find a way to change the behavior. I enjoyed this article very much & plan to share this on my facebook page & print it off to possibly give to the Education Ministry Team at my church in case they have students approach them with the problem of bullying. Thank you so much. This is also timely for me. It is nice to be reminded you are good. when we feel good we can pass that love and goodness on to others. I’ve just been dealing with a bully in our neighborhood, this post was perfectly timed! I have some new ideas for how to help my son. Thanks so much for sharing! 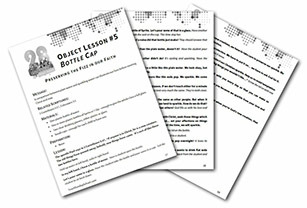 Great ideas for helping kids with an all-too-common problem.